Kanak Vrindavan is a beautiful temple and garden complex situated in Kanak Ghati close to the Amer Fort in Jaipur. Temples at Kanak Vrindavan are dedicated to Lord Krishna. Kanak Vrindavan Jaipur, as seen from distance. Temples at Kanak Vrindavan date back to 1713 AD when Maharajah Jai Singh II, founder of Jaipur ordered construction of a new temple for establishing deity of Lord Govind Dev ji which was moved from Govind Devji Temple in Vridavana in 1669 AD after Mughal emperor Aurangzeb issued orders to destroy Hindu temples across India. Vrindavana is the birth place of Lord Krishna, also famed for ISKON/ Hare Krishna movement. This movement of deities from Vrindavana to Amer/ Jaipur was precautionary as the Kachhava rulers of Jaipur were devout followers of Lord Govind Dev ji. In part, it was also to save Hindu religion from a Muslim fanatic Aurangzeb. From 1669 Ad to 1713 AD the deity did not have any permanent place as it kept moving from one place to another. The Kachhava rulers ruled from Amber; Jaipur was not yet founded. A permanent place was required to establish Govind Devji deity. Kanak Vrindavan was located on the outer edge of Amber town with Mansagar lake right next to it, making it a picturesque place. Maharajah Jai Singh II found this place most suitable for construction of temple for it resembled beautiful Vrindavana, where this deity was originally located with lots of Kadambh trees all around. This view shows how the entire area looks with Jal Mahal in far distance in center of Mansagar Lake and Kanak Vrindavan temple cluster surrounded by greenery all around. Was Maharajah Jai Singh II enamoured with this sight? A final round of shifting of Lord Govind Dev ji’ s idol took place from Kanak Vrindavan to Jai Niwas garden,near City Palace around 1716 AD. This place later came to be known as Govind Dev ji temple. It is from here on that relationship of Lord Govind Devji with Kachhava rulers changed to the one of family deity. After moving Lord Govind Devji to new temple premises at Jai Niwas in Jaipur, the Kanak Vrindavan complex fell into oversight, neglect and disrepair. It was renovated by Hindustan Charitable Trust, few years ago. Kanak Vrindavan complex consists of two temples. One of these temples, Natwar ji temple is supposedly built-in 1707 AD by Maharajah Jai Singh II ‘s sister – Amar kanwar. The other temple – Radha Madhav temple is where Lord Govind Dev ji deity was established before moving it to Govind Devji temple in Jaipur. Natwar ji Temple at Kanak Vrindavan, Jaipur. The gate with a flight of steps is old & original entrance to the temple;it’s not used anymore and remains locked for the public. Natwar ji Temple at Kanak Vrindavan in monochrome. The temple is managed by Govind Devji temple trust. The sanctum of Natwar ji Temple is beautiful and displays similar workmanship as sheesh Mahal in Amer Palace. Of course, all this has been restored as the place was in shambles for more than a century. Everything has been restored beautifully as per the prevalent restoration practices and this effort needs to be appreciated. There is a prohibition on photography in the temple complex. I could only photograph places where this rule is not followed & relaxation is extended. Very limited information is available about history of these temples. The temple follows Haveli style construction which is a signature style of heritage temples in Jaipur. Certainly, these temples are masterpieces with beautiful architecture which is devoid of ostentatious elements. They have a regal manner without going overboard; sort of understated elegance. You must visit Kanak Vrindavan for its beautiful environs and lovely architecture. This is much more than merely a temple!!! Who was Mughal emperor Auranzeb? Auranzeb was the third son of Mughal emporer Shah Jahan who ruled over a vast Indian subcontinent. Shah Jahan built famous Taj Mahal, a UNESCO world heritage site in Agra. Aurangzeb is ill famed in Indian history as he imprisoned his father Shah Jahan; executed his brothers in a struggle for the throne. He was a muslim fanatic who after ascending to power in 1659 AD started a systematic program to destroy all popular Hindu temples and deities from 1666 AD on-wards across India. Auranzeb was a self-proclaimed defendant of Islam imposing the rule of sharia. He imposed Jizya, a tax on non muslims & was a cruel ruler, hated by the masses for his policies which led to the downfall of Mughal rule in India. Mughals were muslims originating from central Asia who invaded India, ruling over a period reigning from 1526 AD to 1707 AD, after which their rule weakened. This write up is now available on GPSmyCity app on iOS App Store, click here to download the GPS enabled article. Beautiful chhatris at Natwar ji temple, Kanak Vrindavan, Jaipur! Wow! Impressive history and the pictures are amazing. Those steps in Monochrome would look amazing. Isn’t it? Thanks for sharing, Arvind. 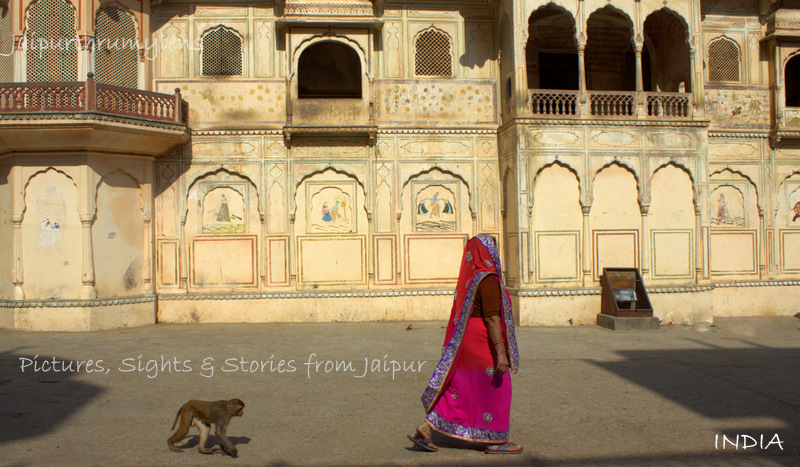 The more I read your posts, the more awed I feel about Jaipur. Thank you, Parul. These temples are not very popular among tourists. I feel these temple have interesting history and great architecture. Parul, we are quite blessed when it comes to temples, history and heritage. Thanks for taking time out to read and share your views.